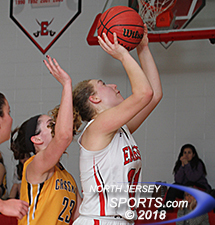 Jenna Cooper pulled down 16 rebounds for Emerson, which picked up a 50-43 victory over rival Cresskill on Thursday night. EMERSON – Emerson senior Jenna Cooper rolled to the basket and scored off a pass from senior Carly Petrower to begin a 12-2 run that propel Emerson to a 50-43 victory over Cresskill on Thursday night. During the run, which began with a minute to go in the third quarter and stretched into midway through the fourth, Cooper scored again from in close and canned a pair of free throws. Sophomore Ariana Matusic tallied on a put-back and drained two foul shots, while sophomore Karly Manning contributed a jump shot. Petrower, who was awarded a “game ball” before the game in acknowledgement of scoring 1,000 career points, was happy for the scoring support. Elek, Manning and Matusic, all sophomores, have backed up seniors Cooper, Petrower and Haley Piccinich all season, which has helped the team be successful. Cresskill freshman point guard Colleen McQuillen finished with 14 points. While head coach Coleen Malzahn also appreciates the contributions of the underclassmen she knows Cooper and Petrower are the heart and soul of the team. 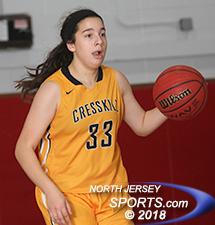 Cresskill freshman Colleen McQuillen, who finished with 14 points, ended the 12-2 run by swishing a three, but Manning (8 points) scored again. Petrower knocked down four free throws down the stretch to put the game out of reach. Petrower led the Cavos with 15 points in the game. The game was close early on. Elek (6 points) drained a three to give Emerson a 7-3 lead, but a three by junior Sophie Green and a jumper by McQuillen gave Cresskill an 8-7 lead heading into the second quarter.The Cavos grabbed a 14-10 lead but Cresskill fought back to tie the score, 18-18, with just over two minutes to go in the first half. Carly Manning hit two 3-pointers and finished with 8 points for Emerson, which will play Indian Hills in the opening round of the Bergen County Tournament. Emerson carried a one-point lead into the third quarter but it appeared that the Cavos were getting to every loose ball as the second half unfolded. Cooper pulled down 16 rebounds, including six on the offensive, giving the Cavos a second chance to score. Midway through the third quarter Cresskill took a 29-27 lead on a basket by senior Julia Maltby (game-high 17 points) but a 9-2 run to close out the quarter pushed the Cavos into a lead they would not relinquish the rest of the way. 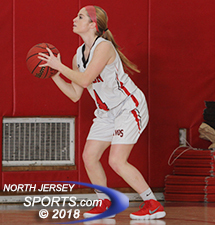 The Cavos, who improved to 6-5, take on Indian Hills on Saturday in the opening round of the Bergen County Woman’s Coaches Association Tournament on Oakland.